Are you a Larry Snotter, wizards and witches tragic? Well we have a murderous tragedy for you! Please note that this game is not affiliated with, or authorised by Warner Brothers or Harry Potter in any way. This is a fan fiction game inspired by Diary of a Minecraft Zombie. Normal Use: 13+, adults, teenagers, fundraiser, birthdays and fun celebration. Setting: First game of the season in Scotland. Character Allocations and Costumes: Guests come dressed as any wizard character they like or as a mythical creature or supernatural ghoul. However, if you would like to allocate specific characters to your guests then click to view all the Harry Potter characters on Wikipedia. Story: It is the first match of the season. Larry Snotter, wizards and witches alike were horrified to see our wizard fall dead from the clouds, presumed murdered. But who would commit such a heinous crime? All the guests are suspects but there is only one true murderer. It turns out that a win at all costs attitude lead to murder. The story has many twists and turns but the pressure that staff put on players is the true killer. This story has jealousy, curses, magic and murder. One thing is for sure. Our wizard is dead and you won't believe who killed him. Can you solve this Larry Snotter murder? Click to get your own copy of A Summary of all 8 Harry Potter Films. The eight Harry Potter movies centre around Harry Potter, a young boy who finds out that he is a wizard and attends Hogwarts School of Witchcraft and Wizardry. The first movie, ‘The Philosopher’s Stone’, opens with Harry Potter, a boy who lives with his uncle, aunt and cousin having lost his parents when he was young. On his eleventh birthday he finds out that he is a wizard and is invited to join Hogwarts School, where he becomes close friends with Ron Weasley and Hermione Granger. He also learns that his parents died defending him from Lord Voldemort; an evil, powerful wizard who, in the process of trying to kill Harry, is defeated and believed dead. At Hogwarts, they find out that the Philosopher’s Stone (which gives the holder eternal life) is hidden in the school and that someone is trying to steal it. When Dumbledore, the Hogwarts Headmaster, is summoned elsewhere leaving the school unguarded, it’s up to the trio to secure the stone and Harry is successful. Quirrel, a teacher possessed by Voldemort in spirit form, is the person trying to steal the stone. The movie culminates in Quirrel’s death and Voldemort, still in spirit form, fleeing the school. In the second movie, ‘The Chamber of Secrets’, Harry hears a mysterious voice in the walls of the castle and later discovers a message written in blood on the wall “The Chamber of Secrets has been opened. Enemies of the heir, beware.” They find out that the Chamber of Secrets was built by one of the Hogwart’s Founders: Salazar Slytherin who can talk to snakes. Later everyone learns that Harry can also talk to snakes and they think that he opened the Chamber. When Ginny goes missing Harry and Ron find out that she’s in the Chamber and they go to rescue her. Harry enters the Chamber alone where he’s confronted by Tom Riddle, a young Voldemort who has emerged from the pages of an old diary and is draining the life from Ginny. He calls on a basilisk to kill Harry who manages to kill the snake and destroy the diary with help from Dumbledore’s phoenix and a powerful sword. As he destroys the diary, Tom Riddle is destroyed. The audience learns that it was Ginny, possessed by an enchanted diary that used to belong to Voldemort, who opened the Chamber. The ‘Prisoner of Azkaban’ is the third movie in the series, and it opens with news that Sirius Black has escaped from the wizard prison Azkaban and plans to kill Harry. Sirius was Harry’s godfather and was also responsible for the deaths of Harry’s parents. The truth comes to light and Harry finds out that Sirius didn’t kill his parents, that it was another of their friends, Peter Pettigrew, who had betrayed them to Voldemort. Pettigrew had been posing as Ron’s pet rat and Sirius, in the form of a dog, attempts to kill him. Things go awry and Sirius is captured. Harry and Hermione, with the help of a time-travel device, replay the evening and help Sirius escape. In the process, Pettigrew also escapes. In the fourth movie, ‘The Goblet of Fire’, Hogwarts is to host the Tri-Wizard tournament for the first time in 100 years. It is a competition between three participants, each representing their wizarding school (Hogwarts, Beauxbaton and Durmstrang). Someone meddles with the selection process and an additional participant, Harry, is chosen. The competitors navigate a series of challenging tasks, the last of which is an enchanted maze. Harry and Cedric Diggory (Hogwart’s other representative) complete the maze and grab the cup at the same time. Unbeknown to them, the cup has been altered by one of Voldemort’s followers into a Portkey that transports them to Voldemort. Voldemort kills Cedric instantly and challenges Harry to a duel. As their wands connect, Voldemort is distracted which gives Harry the chance to return to Hogwarts with Cedric’s body using the Portkey. Harry is declared the winner of the Triwizard Tournament. The fifth movie, ‘The Order of the Phoenix’, Harry returns to Hogwarts to find that people don’t believe that Voldemort is back. Harry has a series of dreams where he connects with Voldemort’s mind, with this insight he is able to save Ron’s dad’s life. Voldemort uses the connection to manipulate Harry and his friends into breaking into the Ministry of Magic to steal a prophesy that involves Voldemort and Harry. The Death Eaters, Voldemort’s followers, arrive and Harry is forced to hand over the prophesy. He and his friends manage to hold off the Death Eaters until the Order of the Phoenix arrives. In the subsequent duel, Sirius Black is killed. Voldemort duels against Dumbledore and is forced to flee, but not before everyone sees he is back, and Harry is vindicated. In ‘The Half-Blood Prince’, the sixth movie, Harry finds out that Voldemort, when he was a student, was investigating Horcruxes. Horcruxes allow wizards to split their souls and store them in different objects, but they can only be created by killing someone. 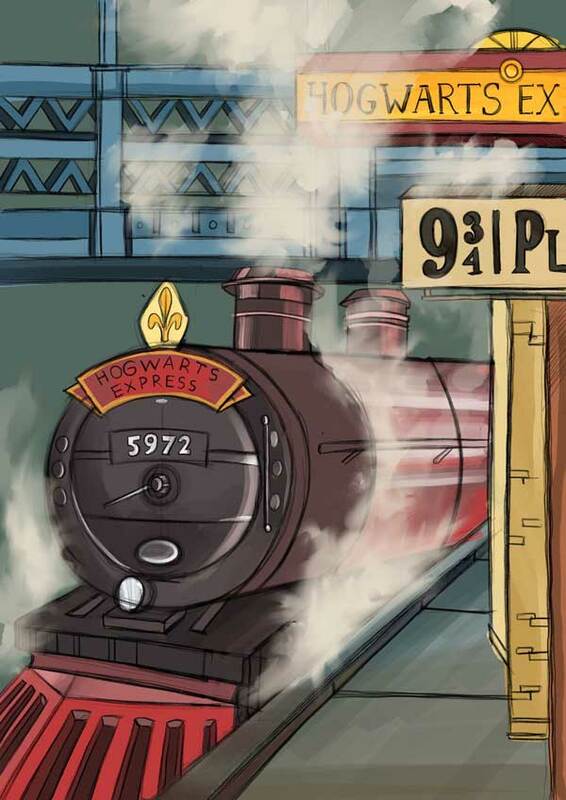 Harry travels with Dumbledore to locate and destroy one of Voldemort’s Horcruxes. Meanwhile Draco Malfoy, Harry’s nemesis, has been working on a plan for Voldemort. He eventually succeeds, and Death Eaters enter Hogwarts through a vanishing cabinet that Draco repaired. When Harry and Dumbledore return, Harry is forced to hide while Snape, the Defence Against the Dark Arts teacher and secret Death Eater, kills Dumbledore. The movie ends with Dumbledore’s funeral and the discovery that the Horcrux they found is a fake. In the seventh movie, ‘The Deathly Hallows Part 1’, Harry, Ron and Hermione are unable to return to Hogwarts, so they are on the run being hunted by the Death Eaters who have taken over the Ministry of Magic. They are determined to complete the mission that Dumbledore assigned to them before he died: trying to find and destroy Voldemort’s remaining Horcruxes (the source of his immortality). During their search they also learn about the Deathly Hallows, 3 objects that together give the holder mastery over death. They manage to destroy a Horcrux, then are captured by Death Eaters. Assisted by a magical elf they escape to Ron’s brother’s house, although the elf is mortally wounded during their getaway. In the last movie, ‘The Deathly Hallows Part 2’, Harry, Hermione and Ron break into the wizard bank Gringotts to find a Horcrux stored in a Death Eater’s vault. They capture the Horcrux and escape on a dragon. They return to Hogwarts in secrecy to find the last two Horcruxes, Voldemort learns of their plans and threatens to attack the school. As the Hogwarts teachers and students prepare to defend the school, Hermione uses a Basilisk fang to destroy the Horcrux from the Vault, Harry captures and destroys the sixth Horcrux and then is forced to face Voldemort alone. Voldemort attempts to kill Harry Potter with a Killing Curse and, thinking that he has been successful, takes his body up to the school to gloat. Harry, in a near-death experience learns that he, himself, had also been a horcrux but that that part of him had been destroyed by the Killing Curse. Harry knows that the snake accompanying Voldemort is the last Horcrux and as he reveals himself to be alive and duels Voldemort, the snake is killed by Harry’s friend Neville and Voldemort becomes mortal. Voldemort is finally defeated as his own killing curse rebounds and kills him.